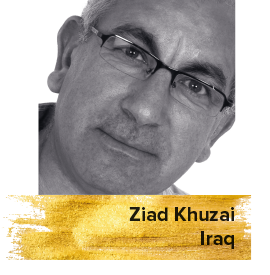 Currently based in London, Iraqi writer and film critic Ziad Khuzai graduated from the Academy of Fine Arts, Dramatic Theatre department, University of Baghdad in 1977. Khuzai participated in the establishment of the first Arab Film Festival in London in 1988, working in collaboration with the British Film Institute’s National Film Theatre. He has also served on the jury of important Arab festivals, including the Dubai International Film Festival and the AFAC - Arab Fund for Arts and Culture in Beirut, Lebanon.